Back in the 1920s, the Moorestown community united to raise money for the operation and maintenance of the Moorestown Community House. Everyone from adults to children helped. Earlier this May, Moorestown Public Schools third graders were called, like those in the 1920s, to raise money for the MCH. Those third graders rose to the challenge and presented the MCH with a donation of $1,300 on June 13 as part of their Unity Day celebration. Students also collected cans to donate to local food pantries, collecting more than 2,000. All of these were done together as a class for Unity Day, a day where the third graders come together as the class of 2025 and with fourth graders at the Upper Elementary School. “The students learned that residents in the 1920s united together to raise money for the Moorestown Community House. The class of 2025 was proud to carry on that tradition. In their own way, they now feel a part of Moorestown’s history,” teacher Kate Morken said. “The purpose of Moorestown Unity Day is to reinforce the importance of community. Celebrating Moorestown’s history, meeting new friends and helping their town — unified our children in a very meaningful way,” teacher Marianne Baker said. Each year, third graders learn about Moorestown in their social studies unit. As part of that lesson, students learn about the MCH and its history. MCH Executive Director Brad Kenney visited the three elementary schools on Tuesday, May 24 to give children more information on things such as the MCH history, its purpose now and the fire last year. He taught the students about the equipment firefighters have used throughout history, as well as how Moorestown’s own volunteer firefighters helped save the MCH. 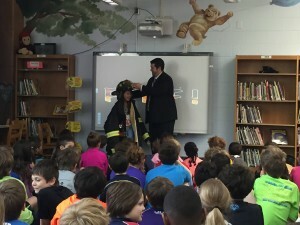 Kenney also introduced the students to the idea of collecting coins to benefit the MCH to be collected in red buckets like the firefighters would use. Called “The 2025 Coin Drive,” it was a fun and educational way for students to work together to raise money for a local cause and learn about one of their hometown’s most historic buildings. “The idea behind it is that anyone in town, whether a third grader or business owner, can contribute in some way to the Moorestown community,” Kenney said. Students searched high and low, collecting money under couch cushions and car consoles, and donating any loose change they found. Students even donated part of their own snack money and savings from piggy banks toward the cause, teacher Cicely Fegley said. June 13 approached fast, and the third graders at all of the schools were invited to the MCH for Unity Day. Between Kenney’s visit and Unity Day, the classes raised $1,007.62 in coins. Each school was matched with a $100 bonus from the Moorestown Home and School Association, resulting in a total $1,307.62 donation presented by the third graders that day. “The grand total was presented at our annual Moorestown Unity Day, and the students were ecstatic. There was clapping, cheering and hugging. It was quite a sight,” Fegley said. “I had the privilege to address them all together at the MCH. I told them who knows what the world will be like (in nine years when they graduate), but they can be sure we will have the MCH because they, as a class, helped to raised money for their Community House. Thanks to them and all donors, the Community House is going to continue on,” Kenney said. Another important component of Moorestown Unity Day was supporting local food pantries. The students learned there are people in need in their own town. According to Morken, students worked hard and creatively to collect canned food items for three local food pantries. They created and distributed flyers, contacted friends, neighbors and family members, helped sort the collected items and designed bags for the canned goods to be packaged. “I just received a ‘thank you’ note from the food pantry chair at the First Baptist Church for the quantity and quality of the donations we sent over to restock the local pantries over the summer months. As she indicated in her thank you note, those donations will help so many people here in Moorestown over the summer months, most of them children. She also noted how awesome the bags were that the students decorated as one of their Unity Day stations,” Mary E. Roberts Elementary School Principal Brian W. Carter said. “Our hope is that the Class of 2025 continues on this path and remains connected to one another and their town,” Baker said.